From the iconic tourist pulls of the Golden Gate Bridge and the infamous Alcatraz prison to its cable cars and Victorian architecture, there is plenty to pull you towards the Californian city of San Francisco. The surrounding bay area is home to some of the world’s finest vineyards in the famous Napa Valley and Sonoma where you can indulge in tantalising tastings. At the southern end of the bay, the future is being defined thanks to the occupants of Silicon Valley where Google, Facebook and Apple are based. So, if a trip to this northern Californian city beckons, here are our top picks for where to drink, dine and sleep. 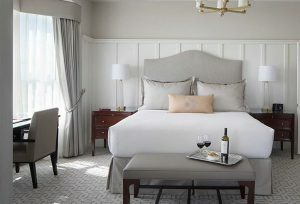 Perched in an enviable location in the desirable Pacific Heights neighbourhood, Hotel Drisco has recently undergone a major renovation programme creating all new guest rooms and bathrooms. Soothing muted neutral tones create a welcoming and relaxing ambience making this Edwardian property a decadent retreat from the hustle and bustle of the city. Luxurious touches such as the morning chauffeur service downtown and the daily homemade biscotti get our vote, as does the daily wine reception hosted as a complimentary event for all guests. Enjoy a private table or mingle with other guests as you sip California’s finest wines accompanied by artisanal cheeses, olives, charcuterie and canapés. We’re just going to come right out and say it – we’re recommending this bar almost certainly because it just happens to be housed in the Twitter building. The social media giant has taken on two vast Art Deco buildings in Market Square comprising 890,000 square feet of office space and an additional 200,000 square feet of retail operations. 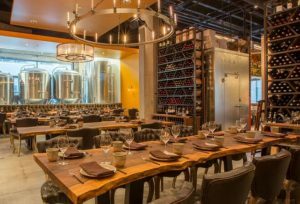 Named after the famous prohibition era and its clandestine whiskey drinkers, Dirty Water offers over a hundred hand-selected wines available by the glass or bottle, as well as 52 beers on tap and a broad range of small batch spirits. There are cheese and charcuterie boards to accompany your drinks as well as their classic ‘Dirty Burger’. 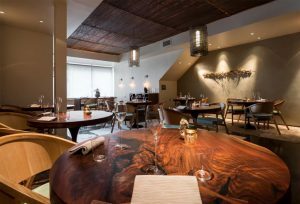 Just moments from San Francisco Bay, Atelier Crenn offers an intimate dining experience from an unassuming facade that boasts just 8 tables. The theatre begins from the moment you arrive with every guest greeted with a poem with each line representing an element in the multi-course tasting menu. With a focus on seafood and vegetables, inspiration is taken from chef patron Dominique Crenn’s mother and childhood memories of her Brittany garden married with real time Californian produce. With father Allain’s paintings decorating the space, this is a true family affair. Open for service from Tuesday to Saturday, booking is essential.